Posted May 10th, 2015 by Audra Williams & filed under Mutter's Day Contest, Submitted. Posted May 9th, 2014 by & filed under Mutter's Day Contest, Submitted. I was ready in surf gear to go to the beach. 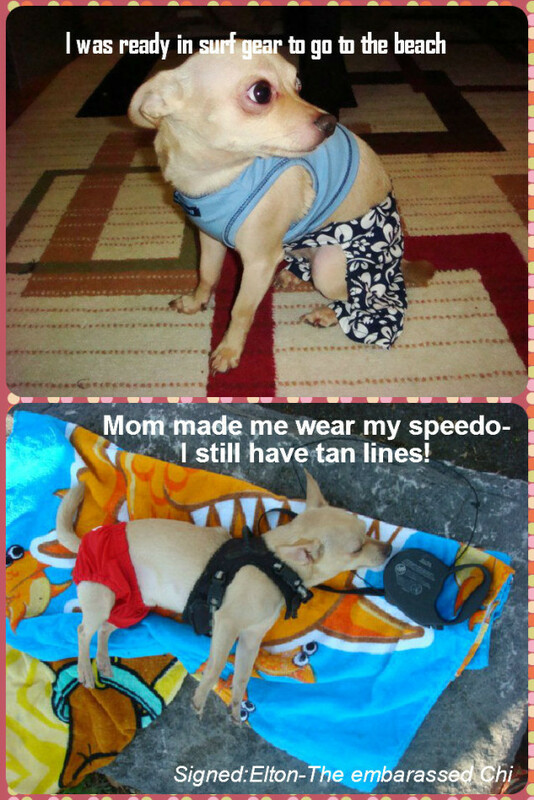 Mom made me wear my speedo-I still have tan lines- signed: Elton the embarassed Chi. Congratulations Angela Laming of Kingston, Ontario! Your submission has earned you the final win for our Mutter’s Day Contest! Keep an eye our for an email from us! Thanks for all the great entries, everyone! We had so much fun reading them all. 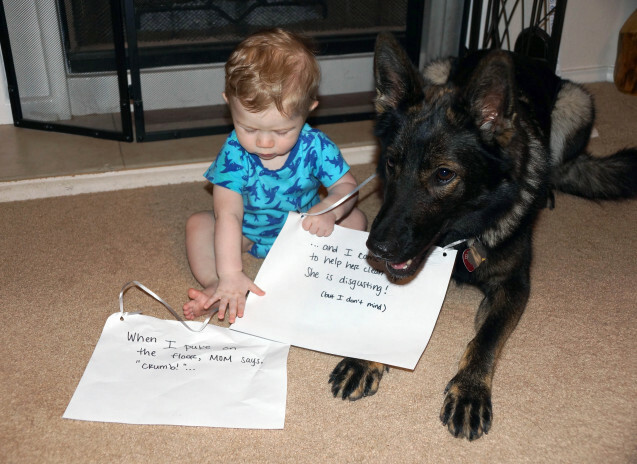 If you weren’t one of our winners, you can always buy your own copy of the Dog Shaming book here! This is literally the best picture we have out of the 15 we took. The baby tried to eat both signs, Bella barely stayed put because she was too excited about the treats we were holding, and we were laughing too hard. But hey, that’s what Mom gets for being so gross! Congratulations Kristen Dunn of Round Rock, Texas! Your submission has earned you the second-last win for our Mutter’s Day Contest! Keep an eye our for an email from us! Mutter’s Day contest week 3! Posted May 2nd, 2014 by & filed under Mutter's Day Contest, Submitted. 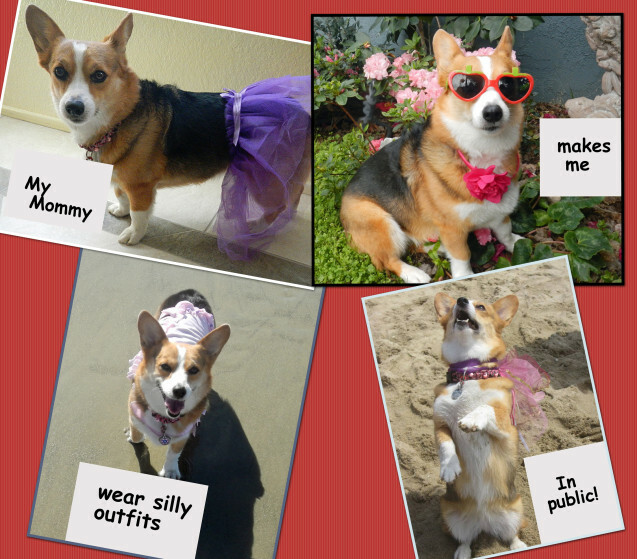 Snickers is a corgi who does not like being dressed up, but she is a good sport and humors her mom, as long as she gets treats to reward her hard work. Congratulations Marquita Serio of Laguna Hills, California! Your submission has earned you the first win for our Mutter’s Day Contest, week 3! Keep an eye our for an email from us! Stay tuned everyone, the second winner will be announced later today. You still have plenty of time to submit your picture to the Mutter’s Day contest. If you need a refresher on the contest guidelines, click here! 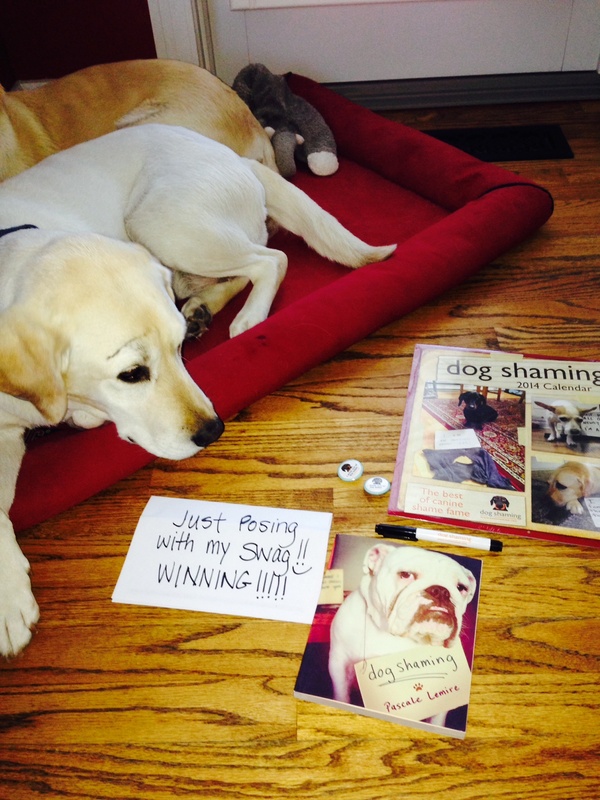 Again, if you can’t wait to win the contest, you can always buy your own copy of the Dog Shaming book here! Second Contest Winner for the Mutter’s Day Contest: Week 2! Posted April 25th, 2014 by & filed under Mutter's Day Contest, Submitted. Our little Chispa (meaning spark in Spanish) likes to sleep by the fire, but sometimes she’s too cute to just look at her, so I wake her up. Luckily, she’s always ready for cuddling and playing so she doesn’t get mad at me. 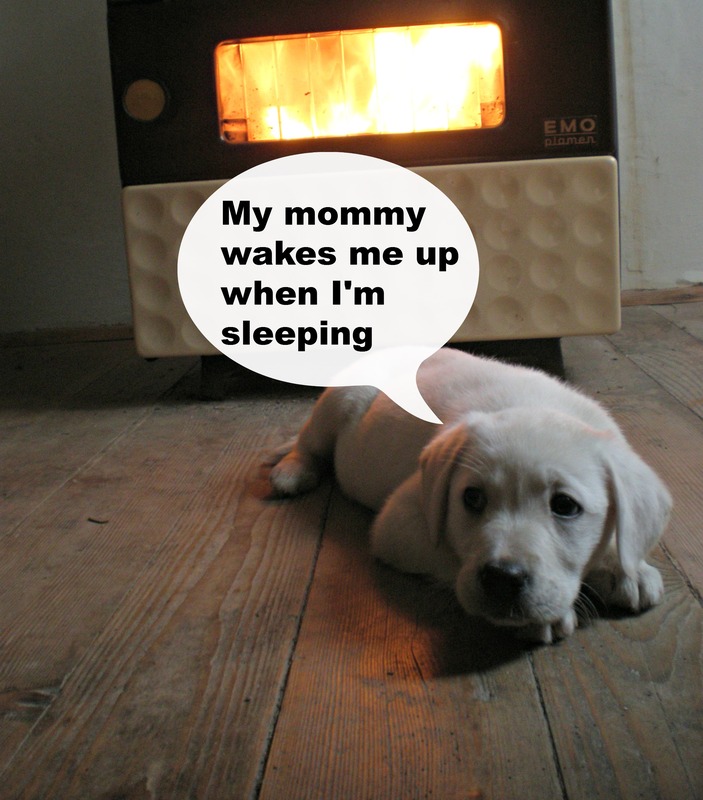 Congrats Tamara Valencic from Prem, Slovenia (hello, dog shaming goes international)! Your submission has earned you the first win for our Mutter’s Day Contest, week 2! Keep an eye our for an email from us! Stay tuned everyone, the second winner will be announced later today. You still have plenty of time to submit your picture to the Mutter’s day contest. If you need a refresher on the contest guidelines, click here! 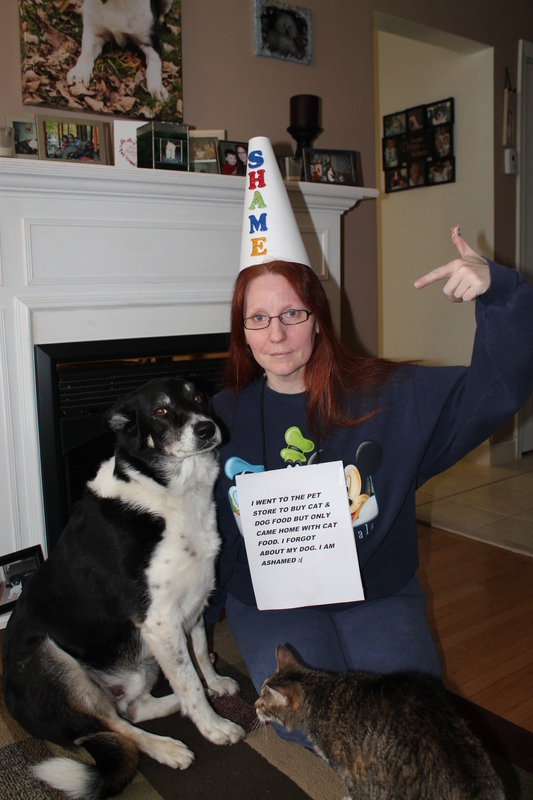 Again, if you can’t wait to win the contest, you can always buy your own copy of the Dog Shaming book here! First Contest Winner for the Mutter’s Day Contest: Week 2! Congrats Avril Kelly from Toronto, Ontario! Your submission has earned you the first win for our Mutter’s Day Contest, week 2! Keep an eye our for an email from us! Stay tuned everyone, the second winner will be announced later today. You still have plenty of time to submit your picture to the Mutter’s day contest. If you need a refresher on the contest guidelines, click here! Again, if you can’t wait to win the contest, you can always buy your own copy of the Dog Shaming book here! Posted April 24th, 2014 by & filed under Mutter's Day Contest, Submitted. Just posing with my swag!!! 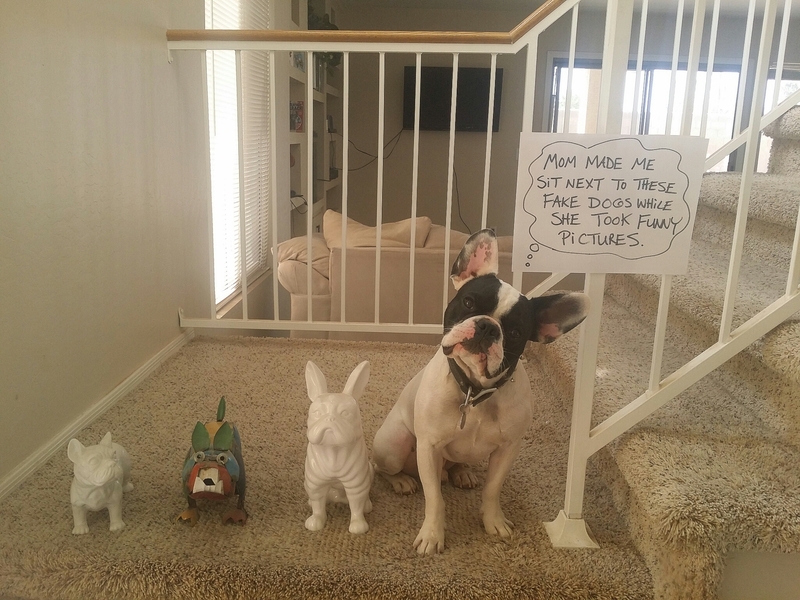 Thanks Dog Shaming!!! Editor’s note: You too can win swag! We’re running our Mutter’s Day contest for a few more weeks. Click here to find out how you can win! Second Contest Winner for the Mutter’s Day Contest: Week 1! Posted April 18th, 2014 by & filed under Mutter's Day Contest, Submitted. Pandora: Mom accidentally ran over my favourite stuffed bunny with the lawn mower. Okay maybe it wasn’t my favourite but still she ran it over. There was cotton everywhere. Congrats Kristin Baker from Hemet, CA! Your submission has earned you the second win for our Mutter’s Day Contest! Keep an eye our for an email from us! You still have plenty of time to submit your picture to the Mutter’s day contest. If you need a refresher on the contest guidelines, click here! Again, if you can’t wait to win the contest, you can always buy your own copy of the Dog Shaming book here! First Contest Winner for the Mutter’s Day Contest: Week 1! Which on is the real French Bulldog? Congrats April McCann from Gilbert, AZ! Your submission has earned you the very first win for our Mutter’s Day Contest! Keep an eye our for an email from us! Stay tuned everyone, the second winner will be announced later today. You still have plenty of time to submit your picture to the Mutter’s day contest. If you need a refresher on the contest guidelines, click here! Introducing our “Mutter’s Day contest”!! Posted April 15th, 2014 by & filed under Mutter's Day Contest. Mother’s Day is right around the corner and we thought it would be fun to hold a Mutter’s Day Contest! We’re turning the tables on dog-moms for this contest! 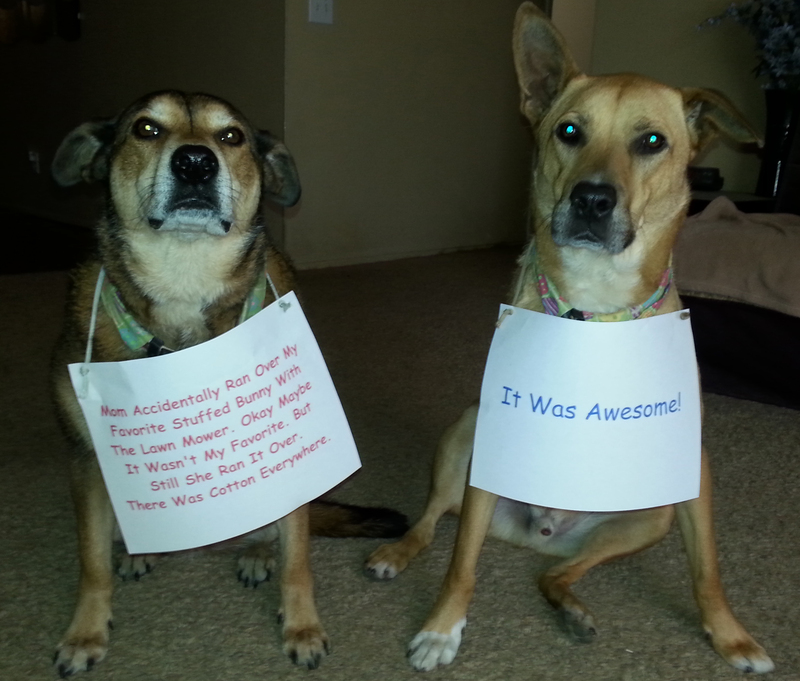 This time the dogs will be shaming their mommies! Did you ever do anything to your pooch for which you feel the need to atone? Ever forget to feed your puppy because you were so busy with the baby? Accidentally step on Bingo’s paw? Lose Rufus’ annoying squeaky toy “on accident”? Time to confess! Every week from now until Mother’s Day, we’ll be picking the best submissions and posting them on Friday! The selected winners will receive signed copies of the Dog Shaming book, as well as some cool Dog Shaming swag! It’s the perfect gift for the dog-loving mom in your life. 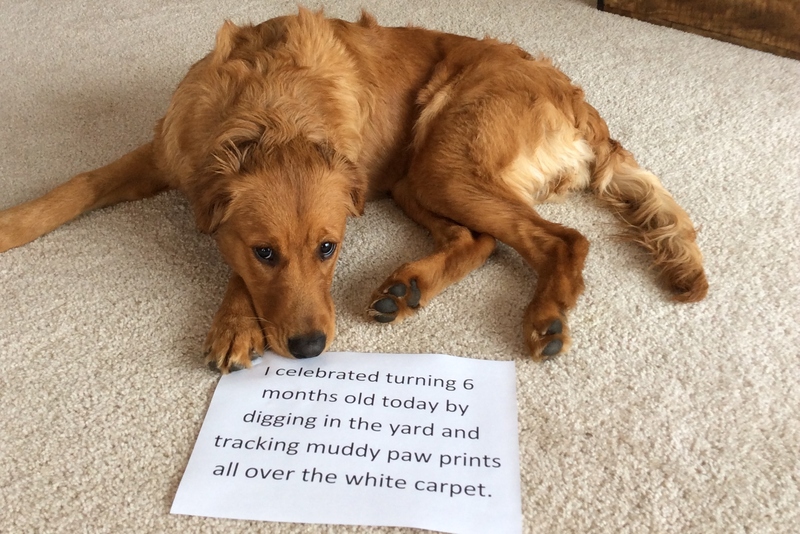 Submit a picture to our blog with a picture of your pooch with or without their “mommy”, along with a sign describing your indiscretion (just like in the picture posted above). Follow us on Twitter and Facebook for even more chances to win! If you don’t want to take any chances in winning the contest to get your hands on the book, feel free to order copy here.